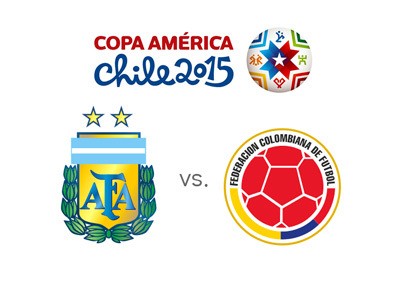 Perhaps the most interesting quarter-final match of the 2015 Copa America is Argentina vs. Colombia, which takes place on Friday June 26th. On one side we have the tournament favourites, Argentina, who on paper have one of the most star-studded lineups in football including Mascherano, Higuain, Di Maria, Tevez, Aguero and of course the one and only Lionel Messi. Argentina finished top of their group with a 2-2 draw against Paraguay and two modest 1-0 victories over Uruguay and Jamaica. Considering all the talent on this team, the boys in white and blue stripes are still looking to find their top form. Colombia entered the knockout round of the competition by finishing 3rd in their group after a 0-1 loss to Venezuela, 1-0 win over Brazil and a 0-0 draw with Peru. Los Cafeteros have quite a team themselves this year with stars such as Ospina, Rodriguez, Falcao and Martinez among others. Lionel Messi and Co. are the big favourites to win and advance to the semis. It would be nice if these two teams (or at least one of them) played up to their full potential from here on. It would make this Copa America tournament a lot more interesting that is for sure.